I’m not sure that I’ve eaten more than a handful of my own meals actually on my own in over ten years. I know maybe it’s not the absolute truth. But it feels like the truth some days. It’s as if whatever food I’m eating is a free-for-all for my children. Sometimes I grab breakfast out of the cabinet and carry it to the minivan as we rush out the door. The very second I open the cereal bar, an alarm system must be triggered because children in all corners of the vehicle ask if they can have some. Perhaps I should be grateful. Thank you, dear children, I did not actually need the calories from this breakfast-on-the-go anyway. But there is something so illogical about this mothering phenomenon. As soon as my children graduate from pureed squash in a jar to their very own mini-portions of actual human food, they want to have what I am eating from my very own plate. Even though we are eating the same food. I may have had to cut it up into non-chokeable portions before putting it on a highchair tray; nevertheless, my lasagna did taste the same as their lasagna. And the Cheerios in my cereal bowl are (earth-shattering announcement, here) the same Cheerios in my child’s bowl. I know older moms are probably chuckling. Surely my own mom is. Because this is probably a universal mothering struggle going back generations upon generations. Let’s face it, Eve should have gotten used to sharing her fruit with another person because once Cain and Abel came along, she’d never eat completely on her own again. The thing is, my kids are buying into the same lie that trips us up all the time. It’s the lie that whatever she has is better than what I have. Maybe we’re even eating the same food. Or maybe it really is different. Maybe she’s sitting down to steak and potatoes while we pick at boxed macaroni and cheese. Or maybe we’re the ones with the gourmet fare while she wolfs down some PB&J. No matter what the dish, so often we just really want what she has. We want the same. And we want it to be the same quality. And we want it to be the same amount. We don’t trust God to care for us uniquely, personally, individually. We don’t trust Him enough to accept what He gives with gratitude, knowing that He loves us and cares for us, knowing that anything He gives us is far more than we deserve or merit. I read in Numbers how Moses divied up supplies to the people of Israel. He gave two carts and four oxen to the sons of Gershon. He gave four carts and eight oxen to the sons of Merari. He didn’t give any carts or oxen to the sons of Kohath. Sounds like a rip-off. Sounds like a big, unfair, scam. Those sons of Kohath could have raised a mighty fine protest about injustice and favoritism and the need for equal distribution of all goods. But Moses gave out the oxen and the carts “according to their service,” and the sons of Kohath cared for “the holy objects, which they carried on the shoulder” (Numbers 7:7-9). Every one of them received what they needed for their particular, God-chosen, unique job. He equipped them for their calling. Some days, I’ll confess, it feels like I don’t have enough. I don’t just mean material goods. I mean enough patience or enough time or enough patience or enough creativity or enough patience or enough sleep—or enough patience. Did I already mention that one? So many others around me seem to have plates heaped full with the very gifts and traits I feel so desperately in need of. But I take my need to Him. Because I don’t need any thing. I don’t need a specific gifting or a particular object. I don’t need to be the same or have the same as anyone else. I NEED JESUS. HE IS ENOUGH FOR ME. HE EQUIPS US FOR OUR CALLING. YES, HE GIVES ME ALL I NEED TO DO WHAT HE WANTS ME TO DO RIGHT HERE IN THIS MOMENT. 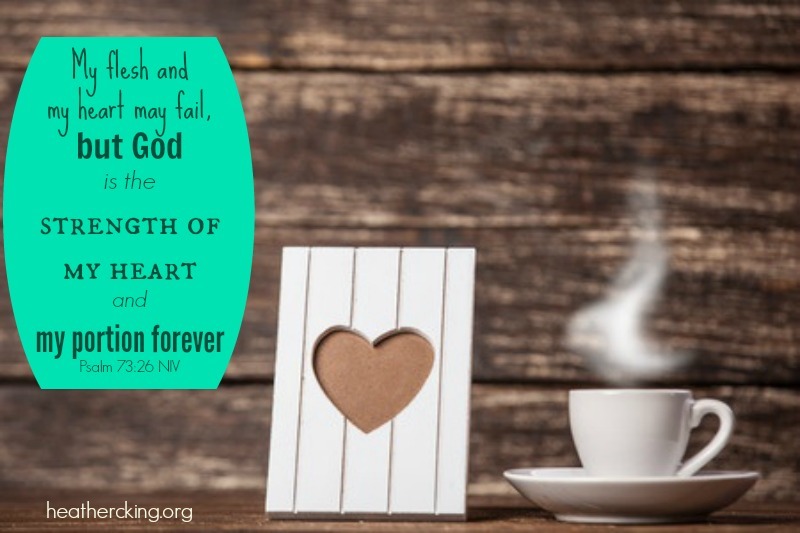 My flesh and my heart may fail, but God is the strength of my heart and my portion forever (Psalm 73:26 NIV). You are my portion, LORD; I have promised to obey your words (Psalm 119:57). “You shall not covet your neighbor’s house; you shall not covet your neighbor’s wife, or his male servant, or his female servant, or his ox, or his donkey, or anything that is your neighbor’s. But I nearly missed it, missed seeing his goodness. Who have nothing to worry about, not a care in the whole wide world. but jealousy is rottenness to the bones. I get it. You have somewhere to be. And you needed to be there 5 minutes ago. And, obviously, you getting there is more important than traffic laws or the personal safety of everyone in my minivan. But here’s the thing. I’m not going to speed up. You may ride close enough for me to see your sunglasses and hair-style in my rear-view mirror…. You may honk in annoyance….. But I won’t be pushed along faster than I intend to go. I don’t want to be pulled into some mysterious competition to see who gets ahead and I won’t let you set the pace of our little road trip. So, I’ll purposefully hang right at the speed limit and not go any faster. And, you know what, I’ll even pull over and let you go by. That’s right. I will step aside and simply conceded defeat. Yes, Mr. Impatient Driver, congratulations. You are faster than me. You are speedier and sportier. If you want so badly to get where you are going, be my guest. I’ll just continue along behind you without all the stress and bother. The inner voice of justice might be screaming at me to do otherwise. I was there first, after all. I have important places to go, too. I was going the speed limit and not plodding along at 15 MPH or anything, so what’s the big deal? Someone needs to teach you a lesson! Where are the state police when you need them? Doesn’t anybody see how right I am and how wrong you are? Seems pretty pointless to fight over who gets to the red light or the stop sign first. And thanks really, for reminding me that there’s no point to any of the seemingly endless competitions we get pushed into by people tailgating our lives. Do we need to vie for the position as the Best Mom, Best Wife, Most Stylish, Smartest, Most Used by God, Best Blogger, Best Cake Baker and Craft Maker, Most Professional, Most Educated, Most Awarded? Sometimes, we find ourselves in the middle of a competition and we’re not even sure how we got there. Someone just seems determined to show us up and put us down. Maybe they are criticizing us behind our back and spreading rumors. Maybe they’ve taken credit for our ideas at work or covered over our contribution to a project. Maybe they’ve courted the attention of the boss and now receive special privileges and honor at the expense of others. Maybe they never cease to brag about their life while making us feel insignificant and inferior. Even in ministry, the struggle is there. Our motives seem so pure, like wanting to share this message God has given us and bring Him glory, but somehow pride sneaks in. We feel like people need to hear what we have to say, so it’s okay to shove others aside and muscle our way to the front. According to Paul, though, that’s not what love does. “does not envy, it does not boast, it is not proud. 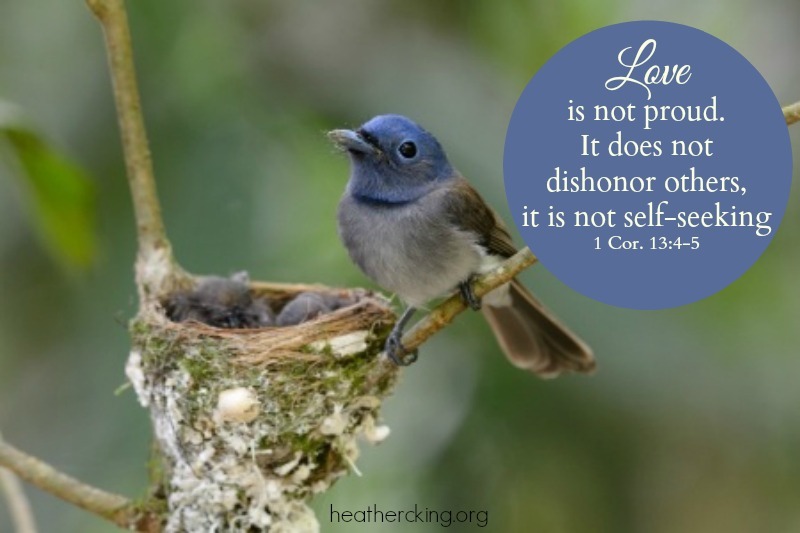 It does not dishonor others, it is not self-seeking” (1 Corinthians 13:4-5 NIV). Love is a humble serving, a self-sacrificing consideration of others, a putting other people first and letting them pass by to sit in a seat of honor or be the first to cross the finish line. “Don’t push your way to the front; don’t sweet-talk your way to the top. Put yourself aside, and help others get ahead. Don’t be obsessed with getting your own advantage. Forget yourselves long enough to lend a helping hand” (Philippians 2:3-4 MSG). So, in love, we may choose to step aside. Let someone else pass. Only He chooses whom to put down and whom to exalt. We can leave it to Him and trust Him with our ministry, our calling, our work, our reputation. All of it. I may have cut it up into non-chokeable portions before putting it on the highchair tray; nevertheless, my lasagna will taste the same as their lasagna. And the Cheerios in my cereal bowl are (earth-shattering announcement, here) the same Cheerios that I put in my child’s bowl. The middle seat in our minivan is prime vehicular real estate. My daughters make mad dashes to the minivan in order to hop in that prize seat first. No one, after all, wants to sit in the back. There are tears and the occasional meltdown. Sister pits herself against sister. They take sides and form alliances to gang up on the offending sibling and rain down minivan justice. Let’s be honest. It’s a whole ugly mess sometimes. And maybe the ugly comes out in us some days, too, as we fearfully try to scramble into the ‘best place’ or grab our own chance at God’s favor and blessing. I’m not exactly sure how Abraham did it, but I want to learn from him how to stop fretting over my position and start rejoicing in my relationship with Christ. He and his nephew Lot stood high enough to overlook the land. Their employees had been fighting. Abraham and Lot were both too wealthy to travel together any longer. They needed separate space and well-defined territory. Abraham let Lot choose first. Or, at the most, I’d offer to flip a coin to make the whole process more fair. Abraham knew that nothing Lot did in that moment could hinder, interrupt or destroy God’s perfect plan for his life. Maybe we’re worried about that sometimes. We see the blessings of God as if there’s a limited supply. If He blesses her, then that leaves less blessing for me. Or maybe this world seems like such a noisy place and social media has only turned up the volume. Sometimes it feels like we need to shout in order to be heard. But I want to be Abraham. I want to trust God enough not to fret or worry over territorial choices or the fear that someone will end up with a better plot of land or a greater blessing. I want to stop pushing and striving to get ahead and simply trust God to take me where He wants me to go. Lot chose the best looking land, of course. He snatched up the prime real estate in a selfish effort to look out for himself. He couldn’t see the corruption and enmity and culture of sin that ruled the land he was choosing: Sodom and Gomorrah. Sometimes, the blessing we’re so sure we want is the worst possible future God could give us. He sees. He knows. He loves us. Sometimes loving us means telling us “no” in the moment. He brought me out into a spacious place; he rescued me because he delighted in me (Psalm 18:19 NIV). When we trust Him, He delights in us indeed. When we choose humility over pride, He sees and takes joy. He will bring us to that spacious place, and it will be perfect, just right, hand-picked and God-designed for you. He asked me which question was the hardest to write about…. I sat across from the morning show host of the radio station WXGM (99.1 FM) and was chatting about my new book, Ask Me Anything, Lord: Opening Our Lives to God’s Questions. It’s a book about how I, the queen of all question-askers, learned to stop talking so much and started letting God ask me questions. God asked other people questions throughout Scripture. Our God is a relation-builder, a reconciler. Right from the beginning, Adam and Eve made a mess of things, disobeyed Him, and hid in the garden. How could they be so foolish, thinking a few fig leaves could hide their whereabouts from an omniscient, all-powerful God who had made them just days before? But God didn’t lecture, chastise, yell, or rain down fire on them. Instead, He sought them out with a simple stroll in the garden and this asking: Where are you? He didn’t ask because He didn’t know. He didn’t ask for His own benefit. He asked to show two wayward children who trembled in fear and hid in shame among the foliage that He loved them. He still desperately wanted relationship with them, and He would go to great lengths and make the ultimate sacrifice in order to draw all of us back to Him. These questions of God’s are all through the Bible, and when we let Him ask them of us they root out fear, help us overcome shame and insecurity, and promise God’s presence and faithful provision in whatever circumstance we face. I knew right away what to answer. When I wrote the book, I had so many questions in Scripture to choose from. God is such a question-asker. He fills Scripture with His patient pursuit of His people. So, I had to leave some out. I couldn’t cover them all, not in one book anyway. I didn’t want to write about Cain. What could we have in common, after all? The first murderer and a middle class minivan mom like me? It seemed like an easy topic to skip over, too irrelevant to my life to pay it any mind. Yet, even though I wanted to skip God’s question to Cain, I couldn’t. I knew God wanted me to write about it, and once I started typing on that blank word processor all about it, I couldn’t stop. Community, after all, can be messy. Relationships are prone to failure. They trip us up with their pits and obstacles and shaky ground. We shove into each other’s space, stepping on toes, bruising egos, making assumptions and getting it wrong. That’s what Cain’s story is about, really, about how his discontentment, jealousy and unforgiveness grew to disastrous levels until he exploded in rage and destroyed another person….and himself. Over time, I realized just how much God needed to ask me the same question that he asked this first murderer in history. Heather, where’s your brother? Where’s your sister? It turns out that Cain and I have far more in common than I realized…surely far more than I wanted to admit. Jealousy….anger….comparing the ministry of someone else to my own meager-looking offerings….defensiveness….whining….broken relationships….needing to forgive others….needing to be forgiven. Maybe you’ve been there also. Maybe you’ve been Cain. Or, perhaps you’ve even been Abel, subject to the cruel lashing out of someone who’s been hurt or overlooked. I don’t know who needed the reminder that day while I chatted on the radio or even who needs to know this today, but God created us for community with Him and community with others. When that’s broken, it rips apart our testimony, it distracts us from ministry purposes, and it taints our offering with bitterness. So, God asks us this question: Where is your brother? Where is your sister? And He reminds us that He loved people…messy, sinful, broken people…enough to die for them. Enough to die for me. If He loved us that much, surely we should love others, too, even when it’s hard and requires repentance or forgiveness, admitting we’re wrong or trampling our own pride. In the end, the hardest of God’s questions to write about became one of the questions that taught me the most. To read more about the questions God asks, click here for information about Ask Me Anything, Lord: Opening Our Lives to God’s Questions. The regimental surgeon made us squirm as he held up what could have been medieval torture devices, but were really medical tools used in the Revolutionary War. A farmer’s wife rolled a slightly wrinkled potato in a barrel of sand, lifted the lid to a jar of pickled eggs, and ran her hand through the dried fruit and beans she had prepared. The cloth maker laid wool and linen socks out to dry after dipping them in a natural yellow dye of onion skin. At the encampment, the soldiers drilled us on firing a cannon before shouting out, “make ready” and signaling us all to cover our ears for the blast. 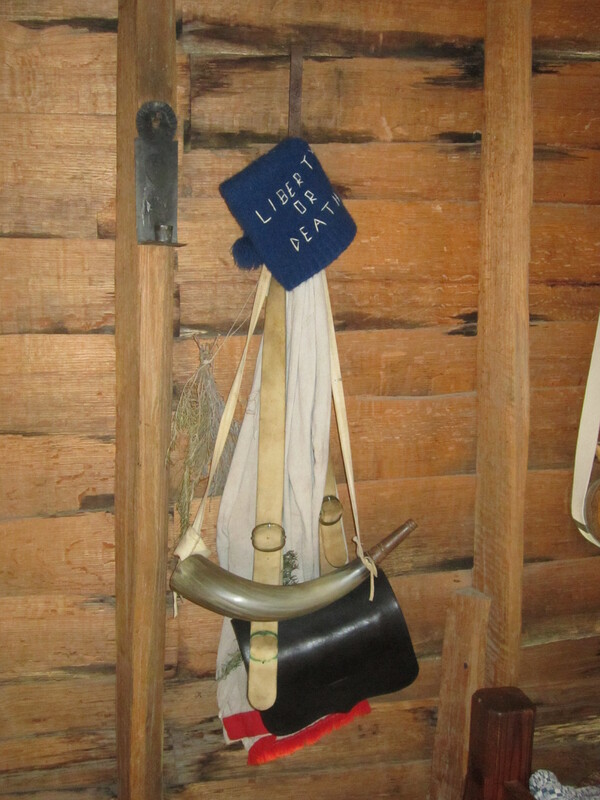 This summer we’ve toured two of the three major historic sites in our area, asked all the usual questions about 17th and 18th century life, and chatted about whether we would want to live before refrigeration, air conditioning, indoor plumbing, voting rights for women, the abolition of slavery, the discovery of antibiotics, and the creation of Wal-Mart and Target. But we happily visit to see how people lived in other times without experiencing extreme levels of discomfort ourselves. Sure, we might be losing ten pounds a day sweating in the middle of July while listening to the interpreters talk about cooking in clay ovens and fighting the British army. But, we’re wearing short sleeves and shorts and we retreat to air conditioning as soon as the tour ends. And really, aren’t we always prevented from fully experiencing life as another person? We might glance over someone’s life, making judgments and assumptions from a safe distance, but we’ll never fully know what it feels like to be her. It’s a lesson I just never seem to learn, one that trips me into pits of envy and then shocks me into disappointment just as quickly over and over again. These women I’ve thought were perfect, the ones I envied, had the houses, the marriages, the kids, the finances, the vacations, the looks and style I wanted–everything just exactly right. I made my assumptions based on superficial evidence and my envy grew based on inaccurate and unfair comparisons between what her life appeared to be and what I knew my life was. Yet, inevitably the façade collapses. The truth is no one’s life is perfect. Too often the closed doors of her pristine home concealed struggles and strife no one expected or knew existed. If we’re ever to overcome envy, we have to stop being duped by projected images and pretend lives and choose contentment in our own real lives with our real husbands in our real homes with our real kids. Because the endless comparisons cost us contentment, rob us of peace, and steal joy right out of our hearts. Grant us, O Lord, the blessing of those whose minds are stayed on You, so that we may be kept in perfect peace: a peace which cannot be broken. Let not our minds rest upon any creature, but only in the Creator; not upon goods, things, houses, lands, inventions of vanities, or foolish fashions, lest, our peace being broken, we become cross and brittle and given over to envy. From all such, deliver us, O God, and grant us Your peace (Yours is the Day, Lord; Yours is the Night, 42). We choose peace when we discipline our mind to be content with what God has given us. More than this. We don’t just accept the gifts God gives; we are grateful for them. We find ways to give thanks even when it’s hard. We redirect our mind whenever we focus on what we don’t have and choose instead to praise God for what He’s done and how He’s blessed us. “A tranquil heart is life to the body, but jealousy is rottenness to the bones” (Proverbs 14:30 HCSB). Envy can eat us up like cancer, destroying us from the inside out. It’s crippling, devastating, and, if left untreated, all-consuming. But that tranquil heart is a heart at peace, content with God’s gifts, certain that God uniquely designed you for these blessings and this life. 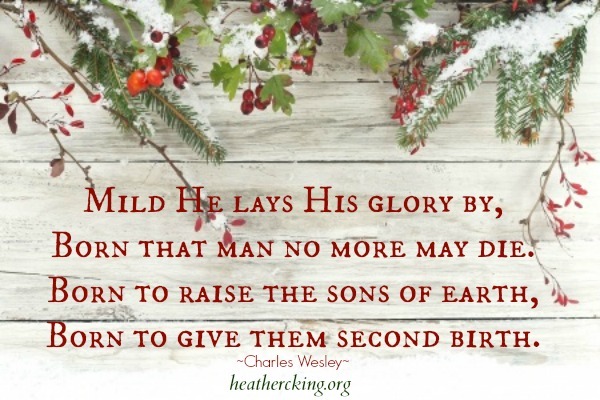 Yes, His gifts to us are good. It’s a heart quietly and purposefully thankful for what is real rather than fooled into wanting imagined perfections, fictional ideals, faulty perceptions, and mistaken judgments. Contentment requires getting real and getting grateful, recognizing that we don’t need perfection in order to have joy; we just need Jesus.